Review all the English from the Genki Disco Warm Up, Rock, Paper, Scissors, What’s your name? and the How are you? song. Using motivation techniques used at Princeton University, we’re going to to transform your students into super energetic superheroes! Mime each action as you teach it using the Words section of the Teacher’s Set. 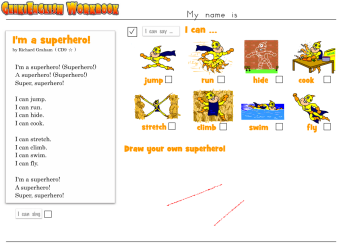 Play the mini lesson to learn the song and finally add in superhero poses for the animation in the Teacher’s Set. Or like these amazing students in Italy! This time we do it a little differently with a class presentation that you are going to video. Then you can either share on social media – to impress the parents! – or exchange with other schools around the world. This is real communication and the perfect record of everything we’ve learnt so far. 1. Put the students in pairs. Choosing 3 different skills from the song. 3. They video each others skits! Ninja Tip: Get the kids to draw a picture of their superhero and hold it up for everyone to see. Ninja Tip 2: If you have your own school, post them on social media one per day, everyone will be desperate to see when their video will go live! Of course it’s not just for kids, here are some of my adult students getting the most out of it. Notice how confident they become when taking on the superhero personality, and look at the classroom atmosphere I’ve been creating where everyone is supportive of everyone else! And if you’d like a traditional game to go with this, you can’t beat the Leapfrog game! This song is the best one so far!! In the classrooms it was one of the most successful songs, and in the one most kids sing from beginning to end feeling like superheros!!! They sing the loudest, they move and show amusement. They really believe they are superheros and superheroines.So much energy!!! Everyone is excited when singing it!!! BRAVO!!! This has proved an amazing song to teach. The boys especially seem to get very involved. I start by asking them to tell me the names of any superheros – Spiderman, Batman, Superman, Fantastic Four, X Men, and the Hulk have all been mentioned. I didn’t use the pictures of the heroes until they had mentioned them. I also ask them to tell me what special powers they have, sort of brainstorming. Some ideas where in English and some in German at this point. I had printed off the black and white pictures and told the children it is such a new song that the pictures are not even in colour yet. I also tell them that they are so lucky as its not on CD yet. I like to make them appreciate what they are getting!!! I then show each picture in sequence and they guess what the action is. They then say I can… I can… after me. We then think of actions together as a class. I pretend to do the actions like a ‘normal person’ and ask them if a superhero would jump so low or chop so slowly. They of course do everything at triple speed then. There have been different actions in different schools too, very interesting especially with fly. We then go over the vocab and the actions together. For the chorus they have stretched their muscles, thrown houses, flown, jumped etc etc. I do like them to do their own actions for the chorus. Finally the music. We all point to the sky to see Genki man and then begin. They really do sing very loudly and its works well to have spoken the song a couple of times before hand. It is also possible to move around the classroom for some of the actions. This song really works well!. I had one special education student who was the cutest superhero ever. The look on her face made my whole day! It is so amazing how GE songs and gestures can perform magic in the classroom. I’m really looking forward to using these fun games. thanks for sharing! I loved this lesson and so did my students! Even the wildest classes were engaged. Instead of drawing superheroes, I printed out blank mask templates and my students colored them, then wore them and presented their superpowers in front of the class. They did a great job and had a blast. Thanks Richard!! I’m ecstatic at having found the Genki English website! It’s fantastic. I love the concept, the positivity and the vibe! I’m privately-tutoring two wonderful already tri-lingual girls in KSA, and have been using your ideas and songs to make our lessons Genki! Yeah, it had an extra syllable, but I got it to work. Culturally sensitive, both mum and the girls loved it! I like your teaching, it’s full of energetic and enthusiastic, it’s motivating and very learning. Thank you very much.